Preface – Regrettably this ship is no longer in-service due its destruction by fire. We have included the report as in general this reflects the quality of service and itinerary being offered on the companies two new ships. 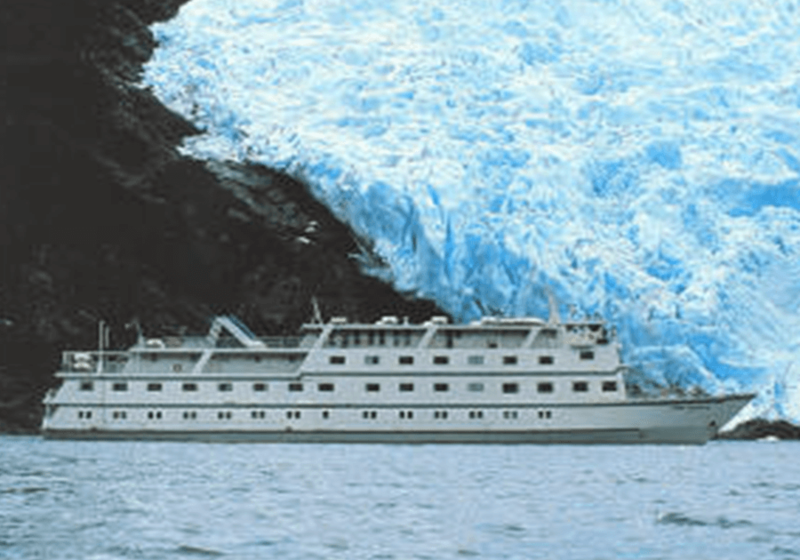 There is an intimate ship called the Terra Australis that does 3, 4 and 7 night cruises in and around the Chilean fjords and glaciers. Having just returned from a site inspection I would like to share the details with you. The ship carries 100 passengers in 50 outside cabins. The cabins are approximately 150+ square feet, with picture windows. All beds are larger than normal twin size, and convert to a king. Bathrooms are basic with showers only. Counter tops are marble with good to better-than-average bathroom amenities. There is no room service, but cabin steward service is very good. If you have seen one of the Clipper Ships (Clipper Cruise Lines) than you will be instantly familiar with the Terra Australis. The ship is clean and well maintained, which is extremely difficult considering all of the various interior and exterior conditions that pass through it on a daily basis. The cruise is considered soft adventure/eco-tourism. If you have been to Alaska, you know that you can see fjords and glaciers from a distance, and sometimes you get lucky and spot a “water creature”. Well, the Chilean counterpart makes Alaska look like a ride at Disney World. On the Terra Australia, you will board zodiacs from the ship and get closer than you ever dreamed to the glaciers and icebergs. You will see numerous species of sea life – seals, otters, birds, etc. You will never be bored. At every turn there is something new to admire. Most of the tours are included in the rate, which makes this product much more all-inclusive than most. Each time you return from a tour, you are offered hot chocolate, a hot local red wine drink or Scotch on glacial ice. It’s a nice touch! The ship supplies all outer gear, except for boots. The cabin steward will clean all of your gear each day if you drop it in the hall when you return from your excursion. The ship offers one seating dining. The food is standard European/American cuisine. Presentation are good. Dishes are a la carte with excellent beef and lots of seafood. Apparently dinners offer only one main course selection each evening. If you charter the ship, I am sure you can arrange the menus to your liking. Lunches are a big meal, due to the fact that you tend to burn up a great deal of energy on the morning tours. Lunches are ala carte (table service) except for the odd buffet here and there. Breakfast is served buffet style. A variety of Chilean wines are included with every meal. There is evening entertainment, consisting of folkloric shows, karaoke, guest participation evenings, disco, etc. There are nature discussions (not lectures) which sound very enjoyable and educational. Most of the passengers attend. There are always hot canapés and complimentary drinks at the discussions. What’s great for incentive groups, is that you can do 3, 4 or 7 nights. I recommend a 4 night cruise, with a 3 night program in Santiago or even Buenos Aires. Though this product is not rated by Berlitz, it is very much a four star experience and certainly incentive quality. So, for your groups that have “been there and done that”, here is something truly different. This report was prepared by Steve Bloss[954 452 8800 | sbloss@www.cruiseco.com] on January 2, 2001. The views expressed as solely those of the author and not necessarily those of WWTCA.